I’m a sucker for challenges – and Julie Hedlund put a new one together that I just could not resist. The12 Days of Christmas – There is still a week left – and the previous days are archived so you can catch up easily! Julie asked that we celebrate what we HAVE accomplished rather than dwell on what we haven’t. She encouraged us to make a list of our successes and surprises, before thinking of any failures or disappointments. And this makes sense…it’s the mindset I encouraged in my kindergarteners when I was teaching. It’s the parenting approach I followed with my own kids. Positive thinking does generate positive results! So here is a rundown of how I spent the past year. 2014 might have been the Chinese Year of the Horse…but for me, it was the Year of Taking Picture Book Writing Classes. I took five major writing classes. I feel blessed that I was able to complete so many this year…I learned so much and connected with incredible mentors and talented writers. I participated in writing challenges and contests throughout the year and definitely put my work out there. I take my hat off to the organizers of each and every one! What I love most about these is that they encourage and inspire me…plus they hold me accountable. It’s too easy to get caught up in the mundane tasks like laundry and cooking…one can always wear the same outfit twice…and there’s always take-out pizza, right? And if you think this list is long, you should know that I left out several that I started but couldn’t complete because of time constraints. Susanna Hill’s Would You Read It Wednesday (on-going…send her a pitch for your story and get feedback from all of her wonderful followers) – I got great feedback and pitch fixes for one or two of mine. I also submitted several stories to the Highlights Magazine Contest (new contest starts TODAY), and also to a couple of publishing houses and agents outside of 12×12. Like they say for the lottery – you can’t win if you don’t play…and you can’t get published if you don’t submit! I stretched my writing muscles in 2014. I’m involved in six critique groups that exchange manuscripts almost every month (and I also give feedback to others who aren’t in my critique groups) – that means some months I was reading and commenting on over two dozen stories – I am fortunate to be a part of the writing journey of so many incredibly talented people! My blog series, Will Write for Cookies, featured twelve amazing authors. A heartfelt thank you to Iza Trapani, Susanna Leonard Hill, Susanne Gervay, David Seow, Emily Lim, Emma Walton Hamilton, Christopher Cheng, Dianne de las Casas, Anne Marie Pace, Jane Yolen, Julie Hedlund, Tara Lazar, Sandra Beckwith, Laura Purdie Salas, and Katharine Holabird. If you missed any of the posts, I’ve linked the author’s names to them…hop over and get some insider info on their writing journeys…and the delicious recipes that each of them shared! I posted over forty picture book reviews with craft activities on my blog and linked them to Susanna Hill’s Perfect Picture Book Friday page. I attended my first SCBWI event – a writing retreat mentored by agents Heather Alexander and Brooks Sherman at Squam Lake in New Hampshire…WOW! Now I understand how special writing retreats and conferences are and why everyone who goes to them says they are an important part of one’s writing journey. Last, but not least, there were surprises that were totally unexpected and quite delightful. A couple of weeks ago, I won a Fire HD 6 tablet in author Donna McDine’s Write What Inspires You blog giveaway…WOW! What a fantastic way to end the year! Thank you so much, Donna! And author Lauri Fortino just nominated me for The Very Inspiring Blogger Award – Thank you so much, Lauri! Your Frog on a Blog is an incredible site…I appreciate your kind thoughts and will do a post about the award later this month. So I’ve looked back on 2014 – and I’m ready to move forward into 2015 – writing, revising and submitting my children’s stories (I’m sending in a manuscript today to Rate Your Story for their FREE day, January 1 – my first submission of the new year…here is their link if you want to check them out: www.rateyourstory.blogspot.com), continuing to connect with fellow writers and others in the kid lit arena (just got an invitation to be interviewed on KidLit411 in April – whoo-hoo…that is an honor! ), and reaching out to parents, teachers and librarians with my Show Me How book, blog and newsletter (I’ll be doing local school and library visits this spring – please contact me if you’d like me to do a presentation to a group of parents, teachers or children). Let’s join together to help every young child become a lover of books and reading! CONGRATULATIONS, Stephanie, I’ll be emailing you privately to get your address so I can ship you the book. Thank you for subscribing…I hope you enjoy the book and the newsletter. And now, Happy New Year, dear friends and readers! It’s been a beautiful year! I so appreciate your support and encouragement. This entry was posted in End of Year recap, Uncategorized and tagged Happy New Year 2015, Julie Hedlund 12 Days of Christmas, Setting Goals, Writing resources by viviankirkfield. Bookmark the permalink. Wow, Vivian! You put me to shame. Congratulations on all your successes! I look forward to hearing publishing news from you soon! Tina…you are a great role model for me…you have done SO much this year and had so many breakthroughs and successes…I am only following your lead. 🙂 Looking forward to another wonderful year of critique with you! What a year, looks like you had an amazing year of creativity, hard work and learning! You are an inspiration! Thank you, Christie! The lists I’ve read from the participants of Julie Hedlund’s 12 Days of Christmas helped me to look carefully at my 2014 day planner…I kept finding things I had done that I had forgotten about. 🙂 🙂 Best wishes for a brilliant year of writing success in 2015! What an incredible year! Well done, Vivian! (Despite the evidence in your wonderful family photo, I suspect you don’t sleep — otherwise, how could you accomplish all this?) What a great celebration to begin what is sure to be another year of wonder. All the best to you as you continue your writing journey! Thanks, Penny! It’s been a wild ride this year, juggling all of the commitments I made…but I would be hard put to say which I would have given up in order to have made it easier. 🙂 Your support and encouragement is so much appreciated! And I wish for you continued success with your writing and books that are coming out soon. Glad you enjoyed the photo…my daughter had purchased matching pjs for the whole family…8 people scurrying around on Christmas morning looking like escapees from Whoville. 🙂 🙂 🙂 It was great fun and I’m so glad she did it…it made a great memory! Vivian, congrats on all the successes and hard work. You have certainly succeeded. BRAVO and I look forward to really meeting you in July. Now go rest for a day!!!! WOW Vivian!! People ask me how I do it all, but now I’m going to have to ask YOU! You’ve had an outstanding year. What a foundation you’ve set for 2015! 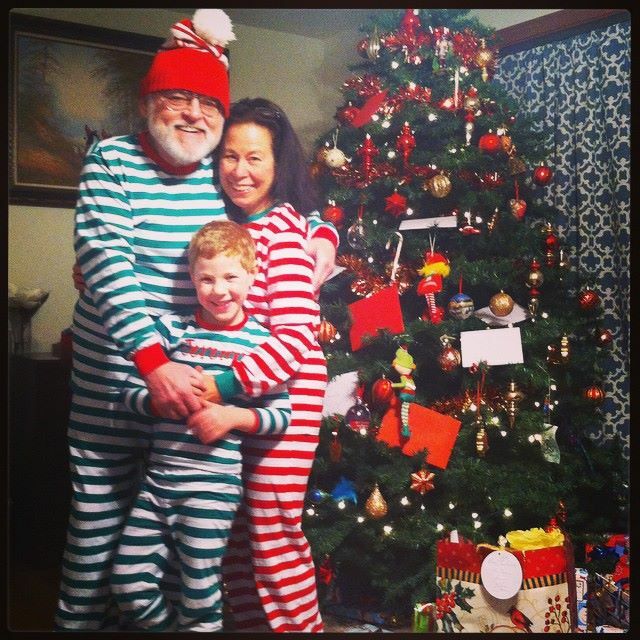 Plus you win the award for the most adorable holiday pajama photo ever! 🙂 Thank you for being such a wonderfully supportive part of 12 x 12 and other writing communities. Your presence never fails to lift my spirits! Happy New Year. And with all that you are doing, Julie, you still find time to come and leave a heartfelt comment on my post! Is it too corny to say that the year is already a success for me as I read all the loving and supportive comments here? Plus, I just clicked SEND on my first submission of the year…to Rate Your Story on their Free Submission day of this month…a much revised version of a story I wrote in Kristen Fulton’s Non-fiction Archaeology class.YAY! 2014 really WAS your year! I’m so glad that I got to hang out with you (well, virtually, at least) as you navigated some choppy waters with such ease. I am super impressed! Wishing you only the best in 2015! A wonderful list! You ARE ready for 2015! Looking forward to sharing work in critique group. Love the PJs! Wow, you are so organized and prepared for the coming year. You have much to be proud for last year. You’ve had an amazing year, Vivian — hope 2015 is even more amazing! Also, totally love the photo. WOW! What a year, Vivian. No wondered you are stepping into such success. Happy New Year. I was definitely busy, Pam…and surrounded with enthusiasm and lots of talent on the part of my classmates in each course. I’m looking forward to putting the lessons learned to good use. 😉 Happy New Year to you as well!